Kobe Nunobiki Herb Garden 「神戸布引ハーブ園」 is located in the top of Mt. Rokko, 400 meters above from the city. 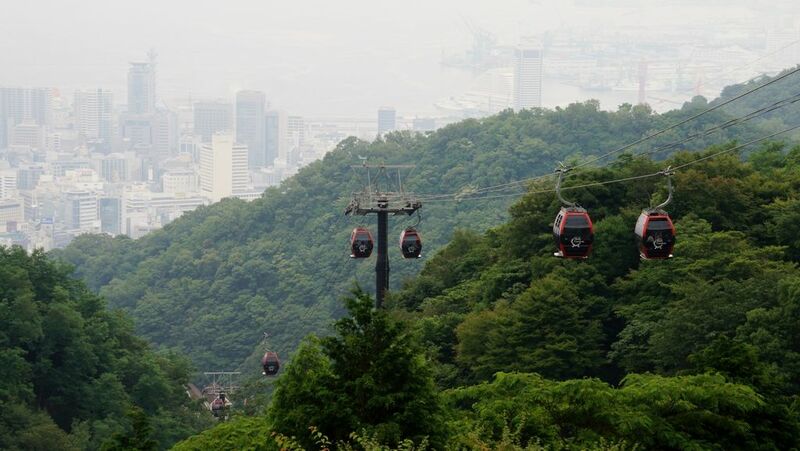 The ropeway ride to the top gives a fantastic aerial view. It’s one of Japan’s largest herb gardens with loads of herb species and seasonal flowers. The garden stands against the scenery of magnificent mountain and overlook the city of Kobe. Visitors can enjoy seeing brilliant and colorful flowers and smell the sweet aroma from the herbs floating in the air. There is a greenhouse for growing flowers and tropical fruits such as guavas and papayas throughout the year. The greenhouse is surrounded by tulips which blooms in April. About 75000 herbs of 200 varieties are spreading out over the slopes. There is also a rose garden to enjoy a variety of roses. In addition to the garden, a observation deck, restaurants, a cafe and a shop which sells herbal and aromatic products. In Autumn, 500 maple trees planted here turn red making a stunning sight. You can hike to the garden via a hiking trail from Shin-Kobe Station. It starts only a few steps north of the station. After 20 minutes hike through the woods takes you to the 43 meter tall Nunobiki Waterfall and a further 20 minutes hike the mountain takes you to the middle station of the Ropeway and There is the lower entrance of Nunobiki Herb Garden.